Background: Silver nanoparticles (AgNPs) have been used as an antimicrobial and disinfectant agent. Nevertheless, there is limited data about antitumor potential. This study has focused on investigating cytotoxic effects of AgNPs from Scrophularia striata flower extract on MCF-7 breast cancer cells and its mechanism of action. Materials and Methods: Thus, a green method was created for the synthesis of AgNPs using an aqueous extract of S. striata flower. Synthesis of AgNPs was described by different analytical techniques including ultraviolet-visible spectrophotometer, field-emission scanning electron microscopy, X-ray diffraction, and Fourier transforms infrared spectroscopy. Cell viability was determined by the 3-[4, 5-dimethylthiazol-2-yl]-a 2,5-diphenyltetrazolium bromide assay. Reactive oxygen species (ROS) formation was measured using probe 2', 7'-dichlorofluorescein diacetate and intracellular calcium (Cai2+) was evaluated with probe flu3-AM. Cells were treated with different concentrations of AgNPs (1, 3, 6, 10, 15, 25, 50, and 100 μg/mL). Results: The results showed that AgNPs hindered cell growth in a dose-dependent manner. AgNPs appeared to have dose-dependent cytotoxicity against MCF-7 cells through activation of the ROS generation and an increase in the intracellular Cai2+ (IC50 52 ± 3.14). Conclusion: In conclusion, the results of this preliminary study demonstrated that AgNPs from S. striata flower extract may be a potential therapeutic agent for human breast cancer treatment. Abbreviations used: S. striata: Scrophularia striata; FESEM: Field-emission scanning electron microscopy; XRD: X-ray diffraction; FTIR: Fourier transforms infrared spectroscopy; MTT: 3-[4, 5-dimethylthiazol-2-yl]-a 2,5-diphenyltetrazolium bromide; ROS: Reactive oxygen species; DCF: 2′, 7′-dichlorofluorescein diacetate; Cai2+: Intracellular calcium. The possible mechanism for cell death effects is to increase the production of reactive oxygen species and increase the amount of intracellular calcium in breast cancer cells. Breast cancer is the most widely recognized reason for tumor-related death in women worldwide, and its frequency has expanded in the most recent decades. It is, therefore, important to introduce new potential strategies for improving the efficacy of current cancer treatments., Hence, introducing a biocompatible and affordable technique for treatment of cancer is imperative. Nanomedicine formulations are nanometer-sized carrier materials designed for increasing the drug tissue bioavailability, thereby improving the treatment of systemically applied chemotherapeutic drugs. Nanomedicine is a new approach to deliver the pharmaceuticals through different routes of administration with safer and more effective therapies compared to conventional methods. Silver nanoparticles (AgNPs) have been among the most commonly used nanomaterials in our health-care system for hundreds of years. Recently, AgNPs have become of intense interest in biomedical applications, because of their antibacterial, antifungal, antiviral, and anti-inflammatory activity. 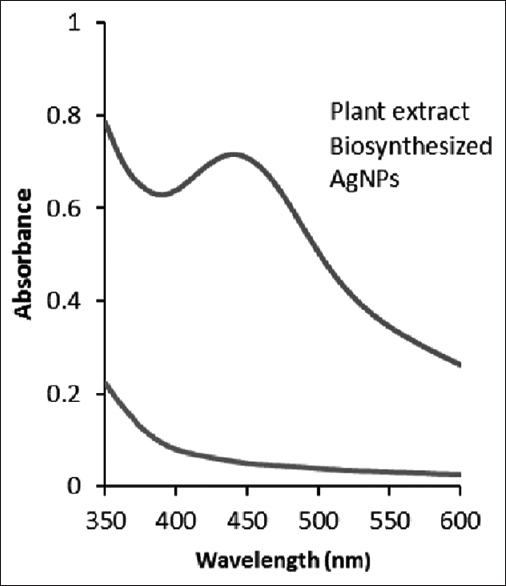 Among the biological techniques, (for example, use of enzymes, microorganisms, and plant extracts), the synthesis of AgNPs using plant extracts is the best option for accessible traditional chemical and physical techniques., Synthesis of nanoparticles using plant extract supplies progression more than chemical and physical method as it is most helpful, environment safety, and simply scaled up for great range production. Cytotoxic chemotherapy is a well-established treatment option for all subtypes of breast cancers, for example, doxorubicin, cisplatin, and also bleomycin., Even though the use of doxorubicin, cisplatin, or bleomycin gives useful impact, the sufficiency and negative marks are unverifiable. In this way, it is important to discover novel restorative administrators against malignancy, which are biocompatible and practical. Natural products have been used in traditional medicine as a source of remedies for thousands of years. The Scrophulariaceae is a family of flowering plants, which is widely distributed in both deciduous and coniferous forests of central Europe, central Asia, North America, and especially in the Mediterranean area and is represented by about 3000 species and 220 genera. Some species of the family have been used since ancient times in traditional medicine to treat eczema, wounds, goiter, ulcers, cancer, and fistulae. In addition, Scrophulariaceae species have been known to be rich in glycosides. In another study, the components of this plant, including cinnamic acid, three flavonoids (quercetin, isorhamnetin-3-O-rutinoside, and nepitrin) and one phenylpropanoid glycoside (acteoside 1) have been identified. It has been indicated that both leaves and seeds of Scrophularia striata contain both anticancer and cell growth enhancing agents. However, the extract of this plant species, that is, S. striata has never been examined against MCF-7 cell line. Thus, this study intended to synthesize AgNPs using the natural framework and to assess potential cytotoxicity and its general mechanisms of action of biologically synthesized AgNPs from S. striata in human breast cancer cells. The flowers of S. striata were collected from the Western Zagros Mountains in Ilam Province, Iran, during April and May 2015. A voucher specimen 24998 was deposited at the Herbarium Department of the Medicinal Plants Research Center of Shiraz University. The flowers of S. striata were washed thoroughly with deionized water. About 10 g of the flowers were added to 100 mL of deionized water and boiled for 15 min in a water bath. The mixture was then filtered with Whatman filter paper grade 42. The filtered extract was stored in a refrigerator at 4°C. This extract was used as a reducing as well as a stabilizing agent. In a typical experiment, for biosynthesis of AgNPs, 60 mL of aqueous plant extract S. striata 10% (10 mL extract and 90 mL deionized water) was mixed with 40 mL AgNO3 solution (0.01 M) in 250 mL Erlenmeyer flask. The flask was incubated for 24 h at 27°C at 120 rpm (Rota max 120, HeiDolph, Germany). A small aliquot of the solutions was used for the ultraviolet-visible (UV-Vis) spectroscopy. After 24 h incubation time, the reaction mixture was centrifuged at 14,000 rpm (Vision Scientific co.) for 15 min and the pellet was resuspended in a small amount of deionized water and then a small amount of suspension was sprayed on a glass slide. The resulting sediment was dried at room temperature and was used for further analyses by field-emission scanning electron microscopy (FESEM), X-ray diffraction (XRD), and Fourier transform infrared spectroscopy (FTIR). Formation of AgNPs from S. striata was confirmed by UV-Vis spectral analysis. The bioreduction of Ag + ions to AgNPs was monitored by UV-Vis spectrophotometer (Rayleigh, UV-2100, China), having a resolution of 1 nm. 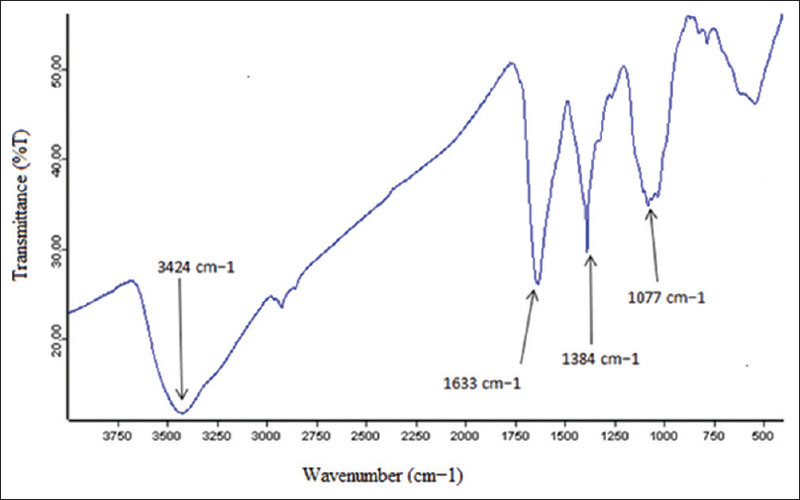 The UV-Vis spectra were recorded using a glass cell with deionized water as a reference. FESEM analysis was performed using a Hitachi S4160 instrument [Japan]. Thin films of the samples were prepared on graphite adhesives. Then, the surface of the samples was coated with gold powder using a sputter hummer instrument. XRD analyses of the synthesized AgNPs from S. striata were conducted using a Bruker diffractometer (D8 Advance, Germany). The X-ray beam was Ni-filtered CuKα radiation from a sealed tube. The synthesized AgNPs from S. striata were also analyzed by FTIR spectroscopy (Bruker Optics Ft Tensor 27, Germany) using KBr discs. The spectra were recorded in the range of 4000–400/cm. The MCF-7 (human breast carcinoma) cell line was purchased from National Cell Bank of Iran (NCBI C135). Cells were cultured in Dulbecco's modified eagle's medium (DMEM) (GIBCO, USA) supplemented with 1.5 g/L sodium bicarbonate, 10% fetal bovine serum (GIBCO, USA), 100 U/mL of penicillin, and 100 μg/mL of streptomycin (GIBCO, USA) in 25 cm2 tissue culture flasks at 37°C in a humidified atmosphere of 5% CO2. Cells were fed every 2–3 days and subcultured once they reached 70%–80% confluence. The cell viability test was measured using the MTT color reduction test which was performed to determine the cytotoxic effect of the AgNPs synthesized from S. striata at different concentrations 1, 3, 6, 10, 15, 25, 50, and 100 μg/mL. The exposure time of cells with different concentrations mentioned above was 48 h. After this treatment, the MTT protocol was implemented. This method is based on the ability to survive cells to metabolize yellow tetrazolium salt MTT to purple formazan crystals by mitochondrial dehydrogenases. About 10 μL of MTT reagent (5 mg/mL) was added to 100 μL of the serum-free culture medium in each well of a 96 well plate, and after 4-h incubation, the medium was removed, and 15 μL dimethyl sulfoxide (DMSO) was added to solubilize the formazan formed by the mitochondrial reductase activity in the viable cells, Absorbance was measured at 570 nm using a microplate reader (Biotek - Elx USA). The percentage of cell viability was calculated according to the following formula: % cell viability = ([OD treated cell − OD blank]/[OD control cell − OD blank]) × 100. Intracellular ROS levels were detected by the fluorescent probe 2′, 7′-dichlorofluorescein diacetate (DCFH2-DA) (Sigma). In this way, 1 mL stock 10 μM prepared in DMSO added to each plate and incubated for 30 min at 37°C. Then, samples measured with fluorescent plate reader (Biotek- FL × 800). DCF fluorescence was assessed at 485 nm excitation and 520 nm emissions. ROS production was determined from an H2O2 standard curve (10–200 nM). Intracellular calcium (Cai2+) of MCF-7 was specified using Ca2+ fluorescent probe flu3-AM (Sigma). Briefly, aliquots of 1-mL MCF-7 suspensions (1 × 106 cells/mL) were washed with buffer A (Phenol red-free DMEM comprising 10-mM HEPES [4-[2-hydroxyethyl] piperazine-1-ethanesulfonic acid, pH 7.0) and resuspended in 200 μL of buffer A. Then, 0.4 μL of fluo 3-AM (1.0M in DMSO) was added. Cells were incubated at room temperature for 30 min and washed with buffer B (DMEM containing 10 mM HEPES, 5% fetal calf serum, and pH 7.4) before assay. Flow cytometric analysis of MCF-7 Cai2+ was carried out using an FACscan Calibur™ flow cytometer (Becton Dickinson, California, USA). Results are expressed as mean ± standard deviation. Measurable assessment of the data was performed with Student's t-test for simple comparison between two values when suitable. For multiple comparisons, data were analyzed by analysis of variance. P < 0.05 was considered statistically significant. Term half maximal inhibitory concentration (IC50) refers to the concentration of toxicant which induces a response halfway between the baseline and maximum after a specified exposure time. The reduction of silver ions into AgNPs during exposure to S. striata flower extracts could be monitored by the color change. The fresh extract of S. striata was yellow in color. However, after addition of AgNO3 and incubation for 24 h, the mixture turned dark brown, which indicated the formation of AgNPs [Figure 1]. 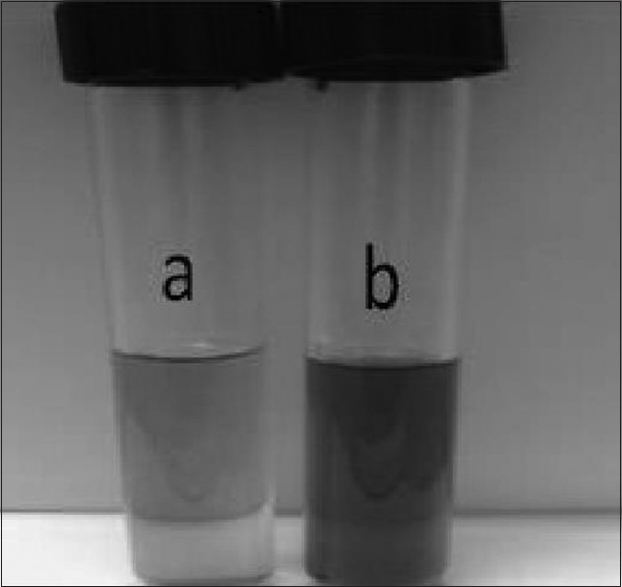 The color changes in aqueous solutions are due to the surface plasmon resonance (SPR) phenomenon. The chemical constituents present in the plant extract play as reducing agents for the bioreduction of Ag ions as well as stabilizing agents. The formation and stability of AgNPs in colloidal solutions were confirmed using UV-Vis spectral analysis. The UV-Vis spectrum of biosynthesized AgNPs of optimized conditions (10% extract concentration, 1:1.5 concentration ratio of the reactants, and time of 24 h) is shown in [Figure 2]. According to the [Figure 2], the peak at 440 nm is corresponding to the SPR band of AgNPs. The above-mentioned optimal conditions are derived from previous experience. The FESEM image of the biosynthesized AgNPs from S. striata in optimized conditions (10% extract concentration, 1:1.5 concentration ratios of the reactants, and time of 24 h) is shown in [Figure 3]. According to the FESEM image, the particle shape of plant-mediated AgNPs was mostly spherical. The checking of FESEM image shows the faint thin layer of other material on the surface of AgNPs because the extract could be played as capping agent as well as a reducing agent. Particle size measurement using FESEM is very difficult and all particle sizes reported in this study are taken from XRD results. Therefore, since it was very difficult to measure the particle size using FESEM, all the reported particle sizes in this paper are derived from the XRD results. The purpose of the SEM method was to obtain the geometric shape of the nanoparticles. Since our synthesis is a biological synthesis, the shape of the particle should be spherical as shown in SEM Figure. If our synthesis was a chemical type, their shape should be triangular. The crystalline structure of AgNPs was characterized using XRD analysis. [Figure 4] shows the XRD patterns of the biosynthesized AgNPs from S. striata. The diffraction peak values at 2θ of 38.12°, 44.35°, 64.56°, and 77.48° correspond to lattice planes at (111), (200), (220), and (311), respectively. The XRD pattern also indicates the face-centered cubic structure of metallic Ag. The particle size of Ag could be calculated by the Scherrer Equation (1): D = 0.94λ/(β cos θ); where D is the average crystallite size, θ is the diffraction angle, β is the full width at half maximum (FWHM), and λ is the X-ray wavelength. The average crystallite size of AgNPs was calculated by Equation (1) and was found to be in the range of 8–12 nm [Table 1]. According to the image of XRD, several couriers have been obtained that after transferring them to the formulas of the “Scherrer equation” numbers shown in the table. After the averaging of the obtained numbers, the nanoparticle size is obtained at about 10 nm. 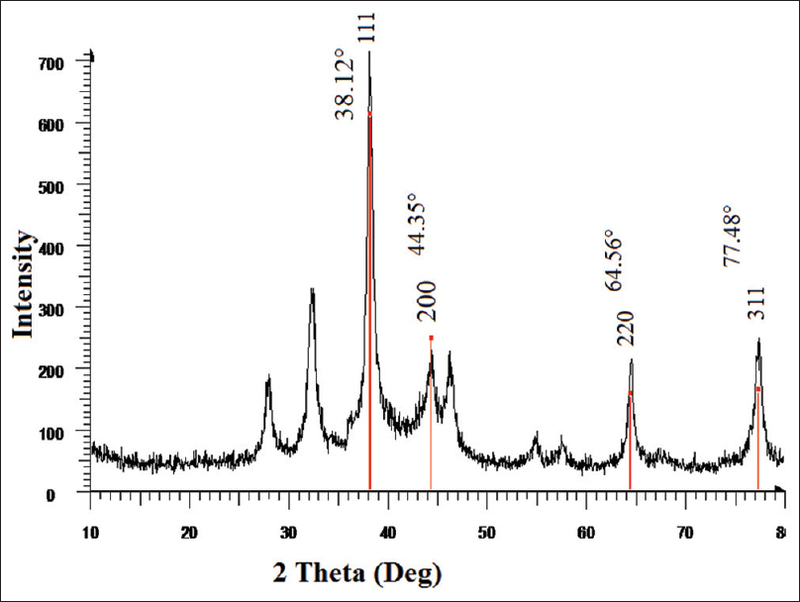 The FTIR spectrum of biosynthesized AgNPs using S. striata flower extract is shown in [Figure 5]. The spectrum shows important bands at 3424, 1633, 1384, and 1077/cm. The strong peak at 1077/cm corresponds to the C–N stretching vibratihon of the amine. The peak at 1384/cm can be associated with the stretching vibration C–O [–C–OH]. Strong, intense peak at 1633/cm is attributed to the C=O stretching vibration. In addition, a broad peak at 3424/cm is assigned to an O–H stretching frequency indicating the presence of hydroxyl groups. These couriers may show the ingredients in the plant extract. The FTIR analysis suggested the presence of hydroxyl, amine, and carbonyl groups in the plant extract, which may have been responsible for the reduction and/or capping and stabilization of AgNPs. The effect of AgNPs on the viability of MCF-7 cells was checked using the MTT assay. The AgNPs were able to reduce the viability of the MCF-7 cells in a concentration-dependent manner as shown in [Figure 6]. The anticancer activity of concentrations at 1, 3, 6, 10, 15, 25, 50, and 100 μg/mL of the synthesized AgNPs from S. striata were evaluated in vitro against MCF-7 breast cancer cell lines after 48 h. AgNPs at concentrations 25, 50 (P < 0.05 vs. control), and 100 μg/mL increased cell death (P < 0.001 vs. control). However, plant extract did not. The effect of different concentrations of AgNPs was tested on MCF-7 cells. Incubation with AgNPs synthesized from S. striata at high concentrations, that is, 25, 50, and 100 μg/mL, led to a reduction in cell viability with IC50 value of 52 ± 3.14 μg/mL. Since the main objective of this study was to investigate the diversity of biological nanoparticles, extract “EXT,” nanoparticles “Nag,” and docetaxel “DOC” were used as controls and the concentration variation in them was not important for this study. Our experiments provided evidence for a molecular mechanism of the AgNP-inducing generation of ROS, and it could be one of the factors for apoptosis. To know the effect of AgNPs in oxidative stress, measured ROS generation using the H2 DCF-DA assay. AgNPs induced intracellular ROS generation was evaluated using intracellular peroxide-dependent oxidation of DCFH2-DA to form fluorescent DCF. DCF fluorescence was detected in cells treated with AgNPs for 48 h. As shown in [Figure 7], the ROS levels generated in response to AgNPs were significantly higher in AgNPs-treated cells than control. Taken together, all these results indicate that cell death is mediated by ROS production, which might alter the cellular redox status, and it is a potential reason for cell death. The AgNPs at concentration 25, 50 (P < 0.05 vs. control) and 100 μg/mL (P < 0.001 vs. control) significantly induced the intracellular ROS production in MCF-7 cells. Treatment with N-acetyl-L-cysteine (5 mM) prevented the enhancement of DCF fluorescence intensity. The effect of different concentrations of AgNPs was tested on MCF-7 cells [Figure 8]. 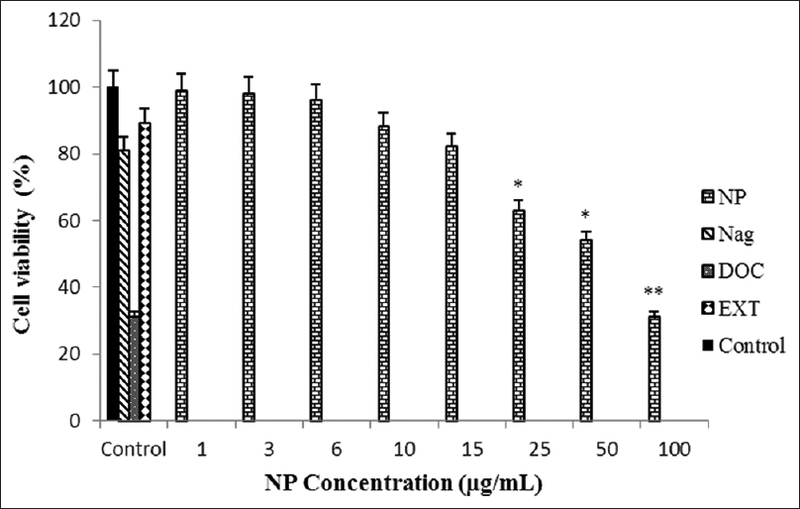 AgNPs synthesized from S. striata increased intracellular of Cai2+ at concentrations 25, 50 (P < 0.05 vs. control) and 100 μg/mL (P < 0.001 vs. control); however, plant extract did not. Silver nitrate (AgNO3) (0.01 M) increased intracellular of Cai2+ (P < 0.05 vs. control). Overall, our results showed that the biologically synthesized AgNPs has antiproliferative activity through induction of cell death in MCF-7 breast cancer cell line, proposing that biologically synthesized AgNPs might be a potential option specialist for human breast cancer therapy. AgNPs are metallic nanostructures with useful surface properties and have been used for various purposes, such as the production of wound dressings and cosmetics and in the medical industry as device-coating agents., However, many studies showed that AgNPs may induce genotoxicity and cytotoxicity in cancer and normal cell lines. Physical and chemical properties of AgNPs, including surface chemistry, size, size distribution, shape, particle morphology, particle composition, coating/capping, agglomeration, dissolution rate, particle reactivity in solution, efficiency of ion release, cell type, and finally type of reducing agents used for synthesis, are vital elements for determination of cytotoxicity. In the present study, the phytochemicals present in the extract of S. striata flower are, namely glycosides and flavonoids, which act as reducing as well as a capping agent and helping in stabilizing the nanoparticles. Since the plant components are flavonoids, some of the effects observed in this study are likely to be reflected in this component. It has already been observed that quercetin in the plant has been effective on MCF-7 cells by increasing cell death, reducing cell proliferation, and effecting free radicals. When silver salt is treated with an extract of S. striata flower, the silver salt is reduced to AgNPs. The synthesized nanoparticles, which are capped with S. striata extract also, exhibit enhanced anticancer activity. In the present study, the UV-Vis results showed a peak at 440 nm corresponding to the SPR in the optimized conditions (10% extract concentration, 1:1.5 concentration ratios of the reactants and time of 24 h). To obtain the optimized conditions for synthesis of AgNPs, the effect of process variables such as extract concentration, the concentration ratio of the reactants and time was studied using UV-Vis spectroscopy. In this assessment, the reduction of silver ions into AgNPs during exposure to S. striata flower extracts could be monitored by the color change. The fresh extract of S. striata was yellow in color. However, after addition of AgNO3 and incubation for 24 h, the mixture turned dark brown, which indicated the formation of AgNPs. It seems that the color changes in aqueous solutions are due to the SPR phenomenon. The chemical constituents present in S. striata flower extract play as reducing agents for the bioreduction of Ag ions as well as stabilizing agents. It has been reported that Podophyllum hexandrum leaves extract effectively synthesized AgNPs at 420 nm. Furthermore, an aqueous extract of Cynodon dactylon leaf was used to produce AgNPs with a size of 30–50 nm. The UV-Vis spectrum of AgNPs in aqueous solution shows an absorbance peak around 450 nm due to SPR. Our results showed that the FESEM images of AgNPs were spherical. 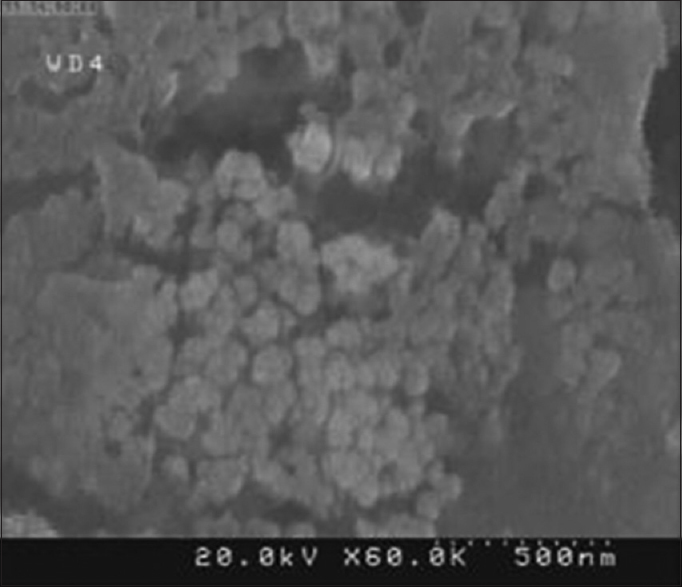 In another study, the SEM image showed relatively spherical-shaped particles in the range of 30–50 nm. XRD pattern also clearly showed that the AgNPs formed by the reduction of Ag+ ions by the Bryophyllum leaf extract are crystalline in nature. The FTIR spectrum showed the presence of various functional groups such as hydroxyl, amine, and carbonyl groups. Indeed, FTIR spectroscopy measurements are carried out to identify the biomolecules that bound specifically on the silver surface and the local molecular environment of capping agent on the nanoparticles. The FTIR spectroscopic study confirmed that the guava extract has the ability to perform both reduction and capping functions on the AgNPs. In another study, the FTIR peak at 1637/cm for AgNPs synthesized using Andrographis paniculata extracts can be attributed to the carbonyl stretch of amides and could be related to proteins that potentially cap AgNPs. The cell viability assay is one of the important methods for cytotoxicity analysis which explain the cellular response to toxic materials and it can provide information on cell death, survival, and metabolic activities. In our experiment, results suggest that AgNPs were able to reduce the cell viability of MCF-7 cells in a dose-dependent manner in MCF-7 cells for 48 h. AgNPs synthesized from S. striata at high concentration concentrations (25, 50, and 100 μg/mL) increased cell death with an IC50 value of 52 ± 3.14 μg/mL. Nevertheless, plant extract at 2 mg/mL did not exhibit any cell death. It has been reported that the IC50 value against A549 cells was 40 μg/mL for AgNPs synthesized by extracts of Gossypium hirsutum. Our results suggest that the highest concentration of AgNPs synthesized from S. striata significantly inhibits the growth of cells. It has been reported that AgNPs and AgNO3 have cytotoxicity in a dose-dependent manner in human Chang liver cells, among these materials AgNPs showed higher cytotoxicity compared to AgNO3. Moreover, AgNPs-treated cells showed the decreased metabolic activity, which depends on nature of cell types and size of nanoparticles. 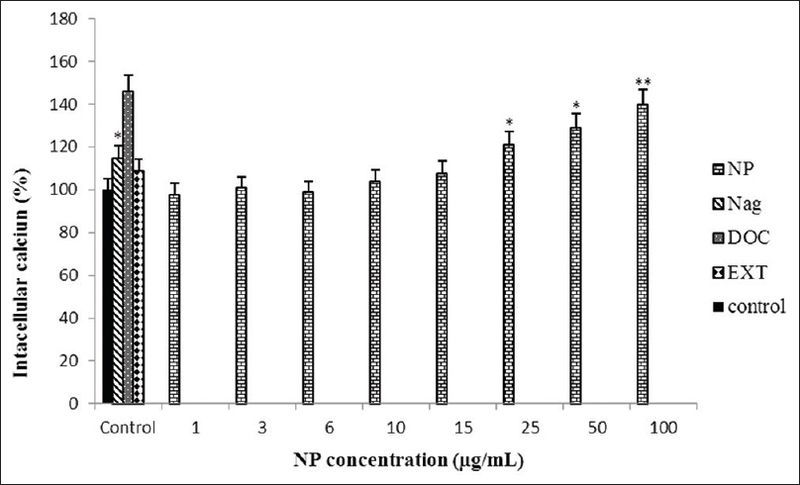 The cytotoxic activity of the synthesized AgNPs and Podophyllum hexandrum (Jaft) extract containing AgNPs has been investigated against human breast cancer cell (MCF-7) and the IC50 were found to be 50 ± 0.04 μg/mL at 24 h. Although the synthesized nanoparticles from the S. striata in this study have reduced cell viability in MCF-7 human breast cancer cell line, it may also affect the normal cells in the body. As an example, in a study, the methanolic EXT of chamomile (Matricaria chamomilla, Asteraceae) flower has been effective in the growth of normal cells, although cell viability has reduced the levels of cancer cell lines. In the present study, the potentiality of AgNPs synthesized from S. striata to induce oxidative stress was assessed by measuring the intracellular ROS level. MCF-7 cells exposed to AgNPs for 48 h showed increased ROS formation as evidenced by the increased DCF fluorescence intensity. The AgNPs from S. striata significantly induced intracellular ROS production in MCF-7 cells at the concentrations 25, 50, and 100 μg/mL. Elevated levels of ROS due to Ag NPs exposure may lead to the failure of cellular antioxidant defense system in MCF-7 cells and thereby severe oxidative attack. Oxidative stress is one of the key mechanisms of toxicity related to nanoparticle exposure. ROS generation has been shown to play an important role in apoptosis induced by treatment with AgNPs [20 nm].,, In an experimental study, the toxicity of starch-coated AgNPs was studied using normal human lung fibroblast cells (IMR-90) and human glioblastoma cells (U251). The toxicity was evaluated using changes in cell morphology, cell viability, metabolic activity, and oxidative stress. In another study, smaller particles of AgNPs with a size 15 nm hydrocarbon-coated are reported to produce more toxicity in macrophages than the size 55 nm by increasing the ROS generation. Interestingly, AgNPs themselves can produce ROS and oxidative stress as well as the process to release Ag+. Nevertheless, it has been concluded that increased levels of oxidative stress markers and decreased levels of antioxidants in carcinoma or the tongue suggest that oxidative stress markers play a significant role in pathophysiology of this cancer. The effect of ROS on cancer cells is controversial. The extent of ROS-induced damage can be exacerbated by decreased efficiency of antioxidant defense mechanisms. Antioxidants have been shown to inhibit initiation and promotion in carcinogenesis and counteract cell immortalization and transformation. It has been observed that diets rich in fruits and vegetables can decrease both oxidative DNA damage and cancer incidence. By contrast, agents increasing oxidative DNA damage usually increase the risk of developing cancer. Understanding the role of ROS at the molecular level is very important for designing a suitable protective strategy for cancer treatment, which has attracted the attention of researchers. AgNPs synthesized from S. striata increased Cai2+ at concentrations 25, 50, and 100 μg/mL in a dose-depended manner in MCF-7 cells although plant extract (only one concentration was used) did not. Cai2+ is believed to play a crucial role in mediating cell death. An increased amount of Cai2+ causes more mitochondrial Ca2+ uptake. Ca2+ accumulation in mitochondria is one of the primary causes of mitochondrial permeability transition (PT), through the opening of the PT-pore, and this is an important key factor in the apoptotic pathway. It has been reported that TiO2, Ag, ZnONPs and quantum dots increase intracellular calcium by releasing calcium from intracellular stores and facilitating the entry of calcium into the cell. Changes in Cai2+ levels mediate a variety of cellular processes. High Cai2+ levels mediate plasma membrane repair but may also induce cell death. Although there was no clear link between increased Cai2+ levels and lysosomal damage or ROS generation in MCF-7 cells, they both were increased cell death in a dose-dependent manner. AgNPs have emerged as an important class of nanomaterials for a wide range of industrial and medical applications. Developing biocompatible molecule, using nanotechnology, as an anticancer agent is one of the novel approaches in the field of cancer therapy. We have successfully synthesized and prepared stable AgNPs (8–12 nm) using an aqueous extract of S. striata flower, which is green, environmentally friendly, cost-effective, and rapid method for synthesis of AgNPs. Hence, this study focused on the cytotoxicity assay of AgNPs from S. striata on MCF-7 breast cancer cells and its mechanism of cell death. We observed that AgNPs from S. striata hindered the growth of MCF-7 breast cancer cells in a dose-dependent manner using the MTT test. It appeared to exert cytotoxic activity through activation of the ROS generation and Cai2+ increase. The present results demonstrated that AgNPs from S. striata may be a potential therapeutic agent for human breast cancer treatment. The authors are grateful for the financial and technical support of Ilam University of Medical Sciences. Ilam University of Medical Sciences. Tan ML, Sulaiman SF, Najimuddin N, Samian MR, Muhammad TS. Methanolic extract of Pereskia bleo (Kunth) DC. (Cactaceae) induces apoptosis in breast carcinoma, T47-D cell line. J Ethnopharmacol 2005;96:287-94. Russo IH, Russo J. Role of hormones in mammary cancer initiation and progression. J Mammary Gland Biol Neoplasia 1998;3:49-61. Matei A, Cernica I, Cadar O, Roman C, Schiopu V. Synthesis and characterization of ZnO – Polymer nanocomposites. Int J Mater Form 2008;1:767-70. Shankar SS, Rai A, Ahmad A, Sastry M. Rapid synthesis of au, ag, and bimetallic au core-ag shell nanoparticles using neem (Azadirachta indica) leaf broth. J Colloid Interface Sci 2004;275:496-502. Vigneshwaran N, Ashtaputre NM, Varadarajan PV, Nachane RP, Paralikar KM, Balasubramanya RH. Biological synthesis of silver nanoparticles using the fungus Aspergillus flavus. Mater Lett 2007;61:1413-8. Zhu SL, Palchik O, Koltypin Y. Gedanken shape-controlled synthesis of silver nanoparticles by pulse sonoelectrochemical methods. Langmuir 2000;16:6396-9. Kim D, Jeong S, Moon J. Synthesis of silver nanoparticles using the polyol process and the influence of precursor injection. Nanotechnology 2006;17:4019-24. Cragg GM, Newman DJ. Plants as a source of anti-cancer agents. J Ethnopharmacol 2005;100:72-9. Richman A, Broothaerts W, Kohn J. Self-incompatibility RNases from three plant families: Homology or convergence? Am J Bot 1997;84:912. Park SU, Park NI, Kim YK, Suh SY, Eom SH, Lee SY. Application of plant biotechnology in the medicinal plant, Rehmannia glutinosa Liboschitz. Med Plants Res 2009;3:1258-63. Ardeshiry Lajimi A, Rezaie-Tavirani M, Mortazavi SA, Barzegar M, Moghadamnia SH, Rezaee MB, et al. 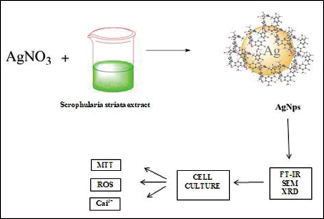 Study of anti cancer property of Scrophularia striata extract on the human astrocytoma cell line (1321). Iran J Pharm Res 2010;9:403-10. Monsef-Esfahani HR, Hajiaghaee R, Shahverdi AR, Khorramizadeh MR, Amini M. Flavonoids, cinnamic acid and phenyl propanoid from aerial parts of Scrophularia striata. Pharm Biol 2010;48:333-6. Ghaffari-Moghaddam M, Hadi-Dabanlou R. Plant mediated green synthesis and antibacterial activity of silver nanoparticles using Crataegus douglasii fruit extract. J Ind Eng Chem 2014;20:739-44. Mameneh R, Ghaffari-Moghaddam M, Solouki M, Samzadeh-Kermani A, Sharifmoghadam MR. Characterization and antibacterial activity of plant mediated silver nanoparticles biosynthesized using Scrophularia striata flower extract. Russ J Appl Chem 2015;88:538-46. Geethalakshmi R, Sarada DV. Gold and silver nanoparticles from Trianthema decandra: Synthesis, characterization, and antimicrobial properties. Int J Nanomedicine 2012;7:5375-84. Ramteke TC, Sarangi BK, Pandey RA. Synthesis of silver nanoparticles from the aqueous extract of leaves of Ocimum sanctum for enhanced antibacterial activity. Chemistry 2013;2013:1-7. Karuppiah M, Rajmohan R. Green synthesis of silver nanoparticles using Ixora coccinea leaves extract. Mater Lett 2013;97:141-3. Sladowski D, Steer SJ, Clothier RH, Balls M. An improved MTT assay. J Immunol Methods 1993;157:203-7. Zhu H, He M, Bannenberg GL, Moldéus P, Shertzer HG. Effects of glutathione and pH on the oxidation of biomarkers of cellular oxidative stress. Arch Toxicol 1996;70:628-34. Abbasi N, Akhavan MM, Rahbar-Roshandel N, Shafiei M. The effects of low and high concentrations of luteolin on cultured human endothelial cells under normal and glucotoxic conditions: Involvement of integrin-linked kinase and cyclooxygenase-2. Phytother Res 2014;28:1301-7. Mason SV, Misra IM, Mohanty AK. Switchgrass [Panicum virgatum] extract mediated green synthesis of silver nanoparticles. Nano Sci Eng 2012;2:47-52. Susan WP, Wijnhoven WJ, Carla A, Werner IH, Agnes GO, Evelyn HW, et al. Nano silver a review of available data and knowledge gaps in human and environmental risk assessment. Nanotoxicology 2009;3:109-38. Tian J, Wong KK, Ho CM, Lok CN, Yu WY, Che CM, et al. Topical delivery of silver nanoparticles promotes wound healing. ChemMedChem 2007;2:129-36. Davatgaran-Taghipour Y, Masoomzadeh S, Farzaei MH, Bahramsoltani R, Karimi-Soureh Z, Rahimi R, et al. Polyphenol nanoformulations for cancer therapy: Experimental evidence and clinical perspective. Int J Nanomedicine 2017;12:2689-702. Yoon KY, Hoon Byeon J, Park JH, Hwang J. Susceptibility constants of escherichia coli and bacillus subtilis to silver and copper nanoparticles. Sci Total Environ 2007;373:572-5. Benakashani F, Allafchian AR, Jalali SA. Biosynthesis of silver nanoparticles using Capparis spinosa L. leaf extract and their antibacterial activity. Karbala Int J Mod Sci 2016;2:251-8. Jeyaraj M, Rajesh M, Arun R, MubarakAli D, Sathishkumar G, Sivanandhan G, et al. An investigation on the cytotoxicity and caspase-mediated apoptotic effect of biologically synthesized silver nanoparticles using Podophyllum hexandrum on human cervical carcinoma cells. Colloids Surf B Biointerfaces 2013;102:708-17. Ghaffari-Moghaddam M, Hadi-Dabanlou R, Khajeh M, Rakhshanipour M, Shameli K. Green synthesis of silver nanoparticles using plant extracts. Korean J Chem Eng 2014;31:548-57. Supraja SM, Chakravarthy N, Priya AJ, Sagadevan E, Kasinathan MK, Sindhu S, et al. Green synthesis of silver nanoparticles from Cynodon dactylon leaf extract. Chem Tech Res 2013;5:271-7. Yang X, Li Q, Wang H, Huang J, Lin L, Wang W, et al. Green synthesis of palladium nanoparticles using broth of Cinnamomum camphora leaf. J Nanopart Res 2010;12:1589-98. Ren Y, Yang H, Wang T, Wang C. Green synthesis and antimicrobial activity of monodisperse silver nanoparticles synthesized using Ginkgo biloba leaf extract. Phys Lett A 2016;380:3773-7. Suriyakalaa U, Antony JJ, Suganya S, Siva D, Sukirtha R, Kamalakkannan S, et al. Hepatocurative activity of biosynthesized silver nanoparticles fabricated using Andrographis paniculata. Colloids Surf B Biointerfaces 2013;102:189-94. Kanipandian N, Thirumurugan R. A feasible approach to phyto-mediated synthesis of silver nanoparticles using industrial crop Gossypium hirsutum (cotton) extract as stabilizing agent and assessment of its in vitro biomedical potential. Ind Crop Prod 2014;55:1-10. Romeilah RM. Anticancer and antioxidant activities of Matricaria chamomilla L. and Marjorana hortensis essential oils. Res J Med Med Sci 2009;4:332-9. AshaRani PV, Low Kah Mun G, Hande MP, Valiyaveettil S. Cytotoxicity and genotoxicity of silver nanoparticles in human cells. ACS Nano 2009;3:279-90. Piao MJ, Kang KA, Lee IK, Kim HS, Kim S, Choi JY, et al. Silver nanoparticles induce oxidative cell damage in human liver cells through inhibition of reduced glutathione and induction of mitochondria-involved apoptosis. Toxicol Lett 2011;201:92-100. Reddy NJ, Nagoor Vali D, Rani M, Rani SS. Evaluation of antioxidant, antibacterial and cytotoxic effects of green synthesized silver nanoparticles by Piper longum fruit. Mater Sci Eng C Mater Biol Appl 2014;34:115-22. Kawata K, Osawa M, Okabe S.In vitro toxicity of silver nanoparticles at noncytotoxic doses to hepG2 human hepatoma cells. Environ Sci Technol 2009;43:6046-51. Badjatia N, Satyam A, Singh P, Seth A, Sharma A. Altered antioxidant status and lipid peroxidation in Indian patients with urothelial bladder carcinoma. Urol Oncol 2010;28:360-7. Matés JM, Pérez-Gómez C, Núñez de Castro I. Antioxidant enzymes and human diseases. Clin Biochem 1999;32:595-603. Halliwell B. Effect of diet on cancer development: Is oxidative DNA damage a biomarker? Free Radic Biol Med 2002;32:968-74. Jeyaraj M, Sathishkumar G, Sivanandhan G, MubarakAli D, Rajesh M, Arun R, et al. Biogenic silver nanoparticles for cancer treatment: An experimental report. Colloids Surf B Biointerfaces 2013;106:86-92. Sharei A, Poceviciute R, Jackson EL, Cho N, Mao S, Hartoularos GC, et al. Plasma membrane recovery kinetics of a microfluidic intracellular delivery platform. Integr Biol (Camb) 2014;6:470-5.